Develop a Regional STEM Magnet School for high school students that becomes a nationally recognized model for partnering with regional school districts, business and industry to produce more high school graduates who are prepared for success in the fields of science, technology, engineering and mathematics. Provide innovative, discovery-based programming for regional elementary and middle school students that develops interest and critical-thinking skills needed for success in the STEM fields, simultaneously preparing a pipeline of STEM Magnet School students. Collaborate with regional school districts to provide professional development opportunities for teachers in the STEM disciplines. Develop university math and science education leaders who can attract external support for research and programming that improves math and science education at the K-12 and college level. 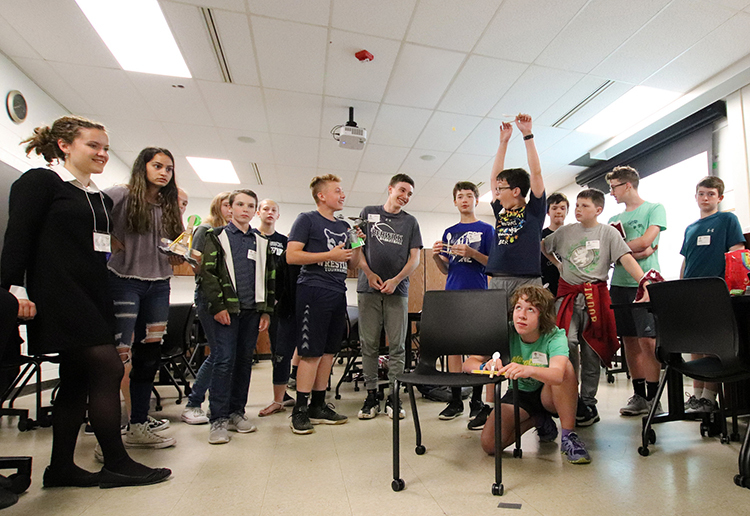 Handmade catapults, balloon shooters and hurricane-proof structures were among the many creations taking centerstage at Bloomsburg University’s annual STEM Adventure Camps this summer. Nearly 1,000 students from four area schools converged on campus for a week of exploring ways to grow their science, technical, engineering and math interests and abilities. Serena Sacher, a senior early childhood education major, saw similar enthusiasm amongst the campers.